Tonal Influences: Why burn yourself? 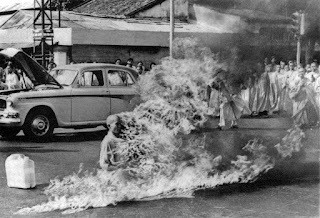 Journalist Malcolm Browne took this picture of Buddhist Monk, Thích Quảng Đức, burning himself alive. This was largely a result of a protest against Diem's government which was heavily Anti-Buddhist in sentiment, since he was largely a Catholic. In Hue, you can see the car that transported the monk to Saigon. What I find very troublesome is the role of religion in terms of oppression and discrimination. Some of these issues can be found in the entire conflict between the Abrahamic based religions (Christianity, Judaism, and Islam) and others. I am not entirely certain why there is this strange vanity that develops between sects and religions. When the monk burned himself in a pyre, it was the beginning of other protests of a similar kind. The power of a religion seems to be ever present. Recently, the Buddhist monk, Thich Nhat Hanh, was barred from going to Vietnam. Apparently, he was getting a little too popular among the young. He's a Zen monk, so I don't see how he could be a threat. He does practice engaged Buddhism, but that is not also really a threat. Perhaps what is feared is the power of a monk burning himself alive. In fact, there were members of his sangha that did burn themselves alive in protest. This might be the core reason for their fears. Monks have been actively moving in Burma, even though the Junta has made it known that they will kill the monks. This is in direct contradiction to their public positions in which they actively try to get the monks to sanction their actions. For the supposedly free election in Burma, there is a planned crackdown as noted in The Independent, a British paper. I suppose there is power in a saffron robe burning.